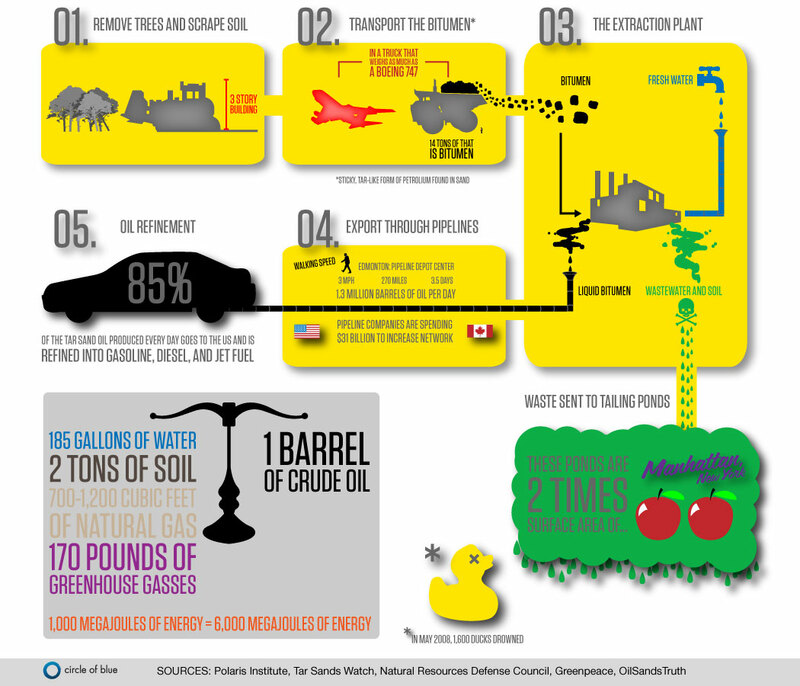 185 gallons of water, two tons of soil, 700-1200 cubic feet of natural gas, and 170 pounds of greenhouse gases make one barrel of crude oil. Graphic by Kalin Wood, a Circle of Blue graphic designer. With contribution from Aubrey Ann Parker, a Circle of Blue reporter and data analyst. Reach them at circleofblue.org/contact . The problem with the oil sands is actually the sheer size of the fossil fuel reserve. The amount of climate change the world experiences depends fundamentally on how much of the planet’s remaining fossil fuels we burn, and how much we leave underground. If we are to avoid dangerous climate change, the great majority of the coal, oil, and gas remaining need to be left underground – including in Canada’s oil sands. Moving to renewable forms of energy is not optional, since fossil fuels were always going to run out. Making that transition now, rather than later, will reduce the risks associated with climate change. It will also reduce the harm generated by the toxic air and water pollution associated with fossil fuel use. We should be adopting alternative energy systems, and striving to be totally renewable-dependent; however, until that can be made economically and technically feasible, we are going to have to use fossil-fuel sources, or we face a future of low economic growth, with power outages and rationing. According to our own government’s EI agency, we are likely to experience power shortages as a matter of consequence of the reckless forced closure of existing coal-fired, natural gas-fired and nuclear power plant systems. Being an energy engineer, I am vehemently against these forced closures, as we will pay a dire price for the coming outages, especially during times of severe winter weather.